Today is the last day of the BlogHer challenge to write about roots. There were a number of days that the writing prompt did not appeal to me or inspire me, so I simply skipped them. I wanted to end the month on a high note though, and today's prompt is asking whether I still live in the place I was born and if not, why did I move. As I mentioned earlier, I was born in Cincinnati, Ohio where many of my relatives still reside. But when I was only a couple of months old, my dad took a job with a new company in Chicago. He had gone on ahead to find a house, so my mom boarded a train headed for Chicago with my sister, age 11, my brother, age 9, my other brother, age 18 months and me, age 2 months. Can you even imagine? I can't. Poor mom! I know my sister was probably a big help, but still! Dad had found a house in a new subdivision, located on a cul de sac. It was a great place for kids! Unfortunately it was also very near O'Hare, so a quiet place it was not. The house also only had two bedrooms, because my dad decided he could finish off the upstairs of the home by himself. In the meantime the four kids shared one bedroom. Eventually dad finished the upstairs into two additional bedrooms, and the boys had one room while the girls took the other. We lived in Chicago until I was 5, and then my dad accepted a job in Des Moines. This time dad purchased a three bedroom home with a walkout basement. The house was on a dead end street surrounded by cornfields. It was a great spot for kids as well, and we could play kick the can and four square in the street without worrying about cars, and many a baseball game was held at the end of the road just before the cornfield began. I loved Des Moines and pictured myself staying there. But college graduation and marriage had other places in store for me. I enjoy making trips back there, whether by car or just in my mind. it came off of a record such as a census and the family names match yours, then it is probably a good hint. Sometimes you will find a tree where the "genealogist" has a child who was born before its mother, or a child born after the mother is dead. So you always need to take these things with a grain of salt. Through several trees on Ancestry I have identified a man on my father's side of the family tree who was a Patriot, meaning he fought or aided in the Revolutionary War. I know this because a man had filed with the Sons of the Revolutionary War on Jacob Christopher Kern. 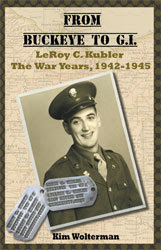 And this man referenced a filing by his sister on the same Patriot to the Daughters of the American Revolution (DAR). Up to this point, nearly every ancestor I have identified came over to the United States in the 1800s. I was struggling to find someone who fought in the Civil War much less the Revolutionary War. This was an exciting discovery! If it is accurate, and that is a big IF. Saturday the Olde Towne Fenton branch of the DAR held an informational meeting, which I attended. They walked us through the process of applying for membership in the DAR, as well as the documentation that is required. In essence, you must prove the birth, marriage and death of each generation (husband and wife) all the way back to your Patriot. (Or until you can tie yourself into the application of someone else who has researched the same Patriot.) 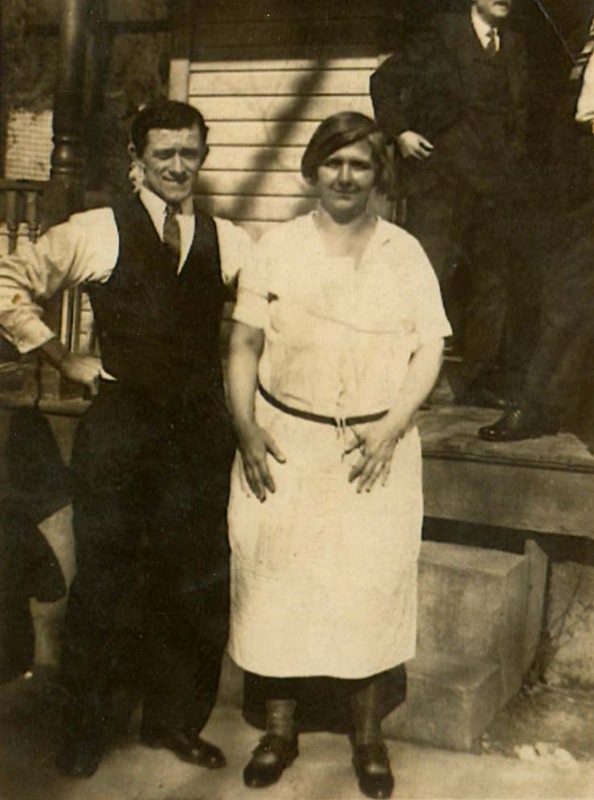 A review of applications for Jacob Kern revealed that some people applied through his son Joseph, while a couple applied through his daughter Magdalena. I would be applying through his son Peter. So essentially the other applications will not help me. Story of my life with genealogy and house history research. Obviously birth, death and marriage records only go back so far in the different states. Then you have to get your hands on other records such as church baptisms and marriages, obituaries, census records, etc. I can see that this process will not be easy or cheap. And I may be barking up the wrong family tree. But I won't know until I try. The BlogHer writing prompt today is about roots and wings. Here is what is says: "The original quote about giving children roots and wings referred to the roots of responsibility and the wings of independence. Does that change your understanding of the quote?" It would be interesting to find out where BlogHer came up with the information about the quote, which reads "There are two things we should give our children: one is roots and the other is wings." A Google search resulted in the quote being attributed to Hodding Carter, a Pulitzer prize-winning journalist from Louisiana, though a Wikipedia site states that the quote was borrowed from Reverend Henry Ward Beecher. I didn't find anything to substantiate this online. But whoever first said it, the words are good ones to parent by. I have always interpreted the saying to mean that we must first create an environment in which our children feel loved and accepted in order for them to become self-assured and independent. Those roots help them build a firm foundation on which to build the rest of their lives - a foundation that will support them even when they take off to pursue their own dreams. My husband and I like to joke that we were either really crappy parents, because our son moved to the East coast following college graduation and our daughter moved to the West coast when she graduated, or we were successful in raising two kids who are confident enough to live so far from home, allowing their own new roots to grow. I hope that it is the latter! Below is a poem I came across in my Internet search this morning. It did not cite an author, but here is a link to the page where I found it. One would be Roots, the other, Wings." Providing a strong, sturdy,safe place to land. For with Roots and with Wings, you'll find all the rest! Another challenging writing prompt from BlogHer today came in the form of the question "How much does your culture come into play in your day-to-day life?" Since I am a fourth-generation American, I would have to truthfully answer that it does not play a large role in my life. I don't cook the recipes of my mom and dad, we never celebrated any holidays that were not also celebrated by most Americans, none of us spoke a different language, and we did not belong to any cultural institutions. I guess I most strongly identified with the Irish in my family tree though. 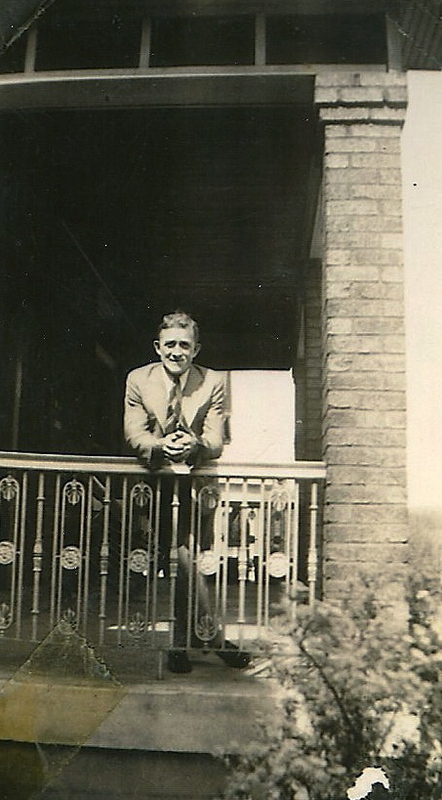 My great-grandfather Michael J. Crusham came over to the United States from Ireland by himself when he was in his early 20s. I understand that he was quite the dancer and won many trophies for his Irish Jig. How I would have loved to have met him! Sometimes I can still get my aunts to sing a few of the Irish songs they learned when they were little, and it is such a treat. I like to think that the work ethic of my parents, grandparents and great-grandparents has been passed along to me and my children. My husband and I both studied hard and sacrificed to attend graduate school, and then worked for a long time for companies that allowed us to absorb the essence of what it takes to be successful in business. This enabled us to become entreprenuers and have some control over our own destinies. 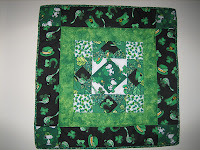 I'll close with one of my favorite Irish blessings. 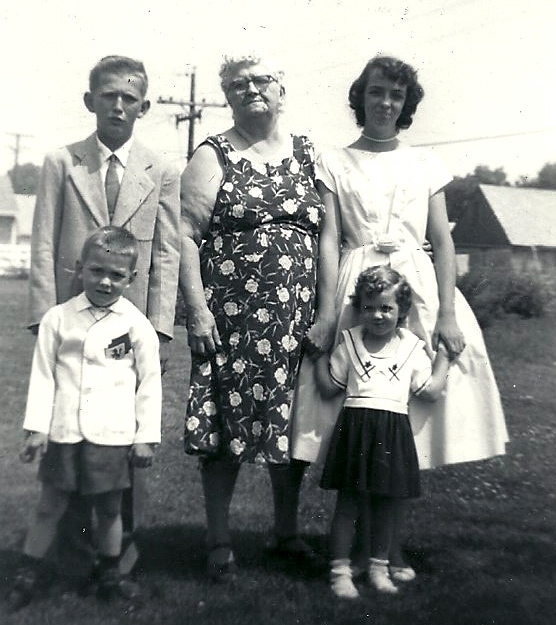 Today I am back on track with the BlogHer June NaBloPoMo, and today's writing prompt is to discuss a family tradition that has been passed down. I can't hear the word tradition without my mind breaking into the song "Tradition" from Fiddler on the Roof. But since I am not Jewish and this is no musical, I will have to strike out on my own for this one. I have to admit that nothing immediately came to my mind, so I turned to the dictionary thinking that a definition of the word might strike a chord with me. Looking at the definitions and thinking back on my own childhood, I guess what strikes me is how we celebrated the holidays, in particular Christmas. My dad loved to decorate the house for Christmas, and we were often the house on the block with the most lights. Nothing to the extreme of Christmas Vacation of course, but all the lights on the gutters and around the windows along with the two large plastic candles definitely made our house glow in the darkness. Santa Claus always arrived at our house on Christmas Eve, usually when my brother and I were taking a bath or had run to the store with one of our parents. (The sneaky, jolly fellow.) We then opened our presents on Christmas Eve. My mom and dad would make a punch to drink, and the gift opening was a free for all. After my husband and I were married we began our own collection of Christmas decorations, making a new set of ornaments together each year. 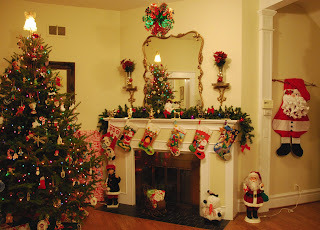 We have lots of decorations now, including some of the ones from my mom and dad. When our children were young Santa came after they went to bed, and the gifts were opened on Christmas morning. After they got older, we returned to opening presents on Christmas Eve. One thing that we incorporated in our family was my in-laws far more civilized method of going person to person when opening gifts. Each person gets to savor the moment of unwrapping a present before the next person begins opening one. It definitely extends the whole process, but you get to truly see what each person receives and their reaction to the present. The last couple of years I have been experimenting with pretty cocktails at our house to drink as we exchange gifts. Ours are shaken, not stirred, and they are yummy! As I finish this post, I wonder what my children would write about if they were to tackle this writing prompt? This was actually the BlogHer writing prompt for yesterday, but due to the fact that we were having 35 of my husband's associates and family members at our house for dinner last night, I was too busy to write on Friday. 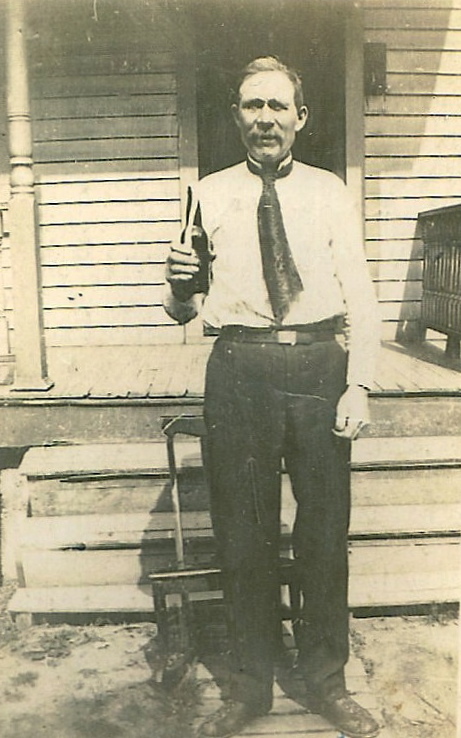 My most interesting story involves my great-grandmother Catherine Colgan, who married Michael J. Crusham pictured in a previous post. 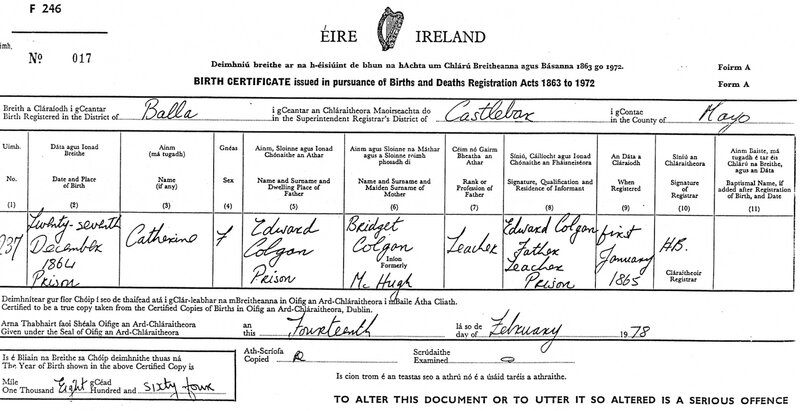 One of my cousins had obtained Catherine's birth certificate which indicated that she had been born to Edward and Bridget Colgan on 27 December 1864 and listed the Place of Birth as Prison. 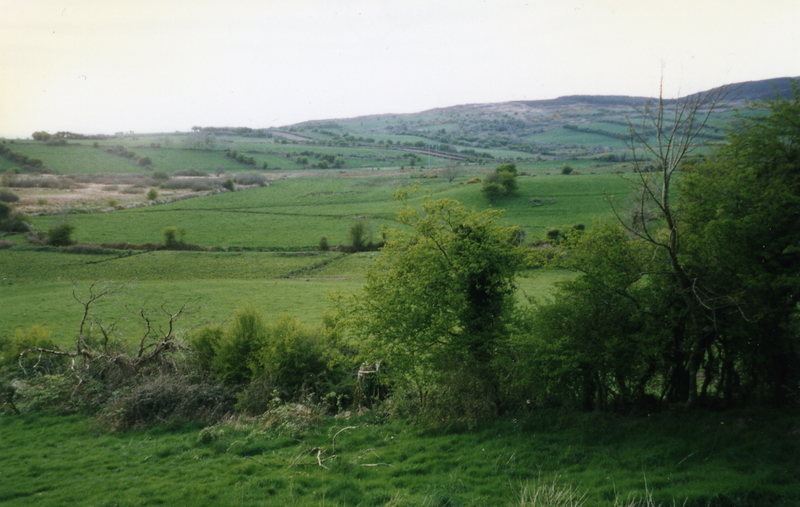 The birth was registered in the District of Balla in the County of Mayo in Ireland. There was much speculation in the family as to why she might have been born in prison. Both Edward and Bridget were school teachers in Ireland before emigrating to the United States in 1867. Her father was rumored to have been a member of the Fenian Brotherhood, so perhaps he and his wife were thrown in prison because of that? In 1987 my husband and I traveled to the Republic of Ireland, so one of my missions was to find out what I could about the prison birth. 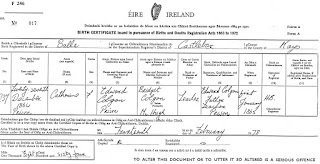 At the Family Research Center in County Mayo I showed the genealogist Catherine's birth certificate. I said that while I was pretty sure the prison was no longer standing, I was wondering if they had any records available so that I could see why the Colgans were in prison when they had their baby. He looked at me with a puzzled expression on his face, and then told me that Prison is a village! We laughed about the misunderstanding, and I told him that he had ruined our favorite family story as we had thought Catherine was born in a prison. He said, "Oh and to be sure she was, just not the kind with bars on the windows!" Well, I was a bit stumped by today's writing prompt, which asks if I was named after anyone in my family tree. As it so happens, I was not. But I am fascinated by the naming patterns I have come across while researching my family history. My mom's maiden name was Crusham, and her father was named Michael. His father was also named Michael as was his grandfather and great-grandfather. I have only been able to research Michael Crusham back to 1811 in Ireland so there may be more Michaels that I don't know about. My mom also had a brother named Michael, but he broke the chain and did not name either of his sons Michael. One of his siblings named a son Michael and there are others named Michael Crusham in the tree, but not in the direct line of father to son. Still, having five generations of Michael Crushams is pretty impressive, I think. Looking at naming patterns can sometimes help when you hit a brick wall in your family research. 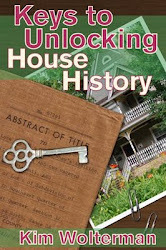 Today's writing prompt from BlogHer asks if I am interested in genealogy (YES!) and if I have a family tree constructed (YES!). As I mentioned in yesterday's post, I first got involved in genealogy back in 1989. My mom and dad had stopped by our house on their drive from Cincinnati to Boulder to see my brother. My mom handed me a hand-written family tree on her side of the family, put together by one of my cousins. We talked briefly about the tree, and I set it to the side. On their way back from Colorado my folks were involved in a horrific car accident in the middle of Kansas. My mom was killed instantly and my dad was taken to a hospital in Hays, Kansas in critical condition. My mom was only 69 years old at the time. I was 32, and thought I would have much more time with my beloved mother. Months later I pulled out the family tree and I recognized for perhaps the first time that my older family members would not be around forever. 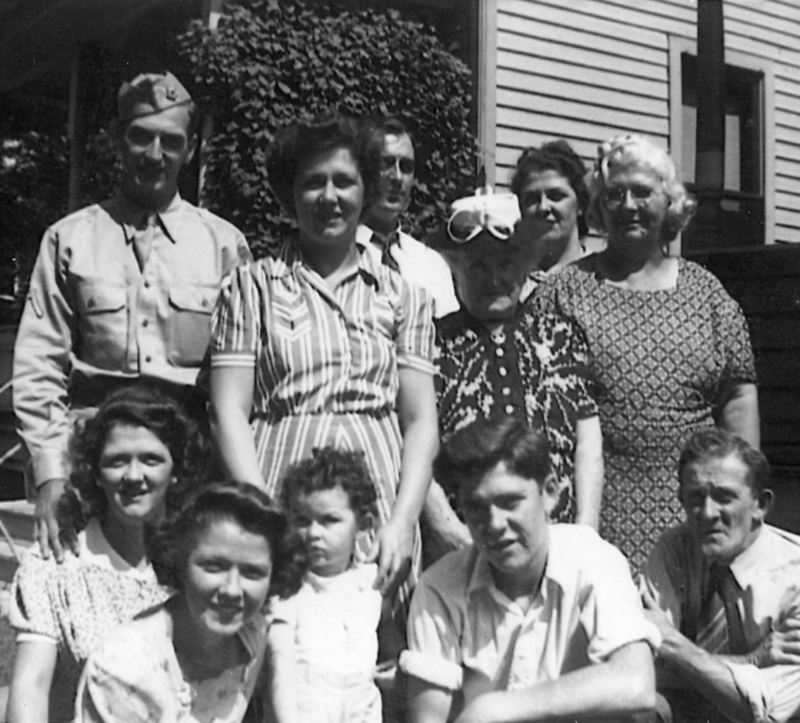 So I began asking questions about my grandparents and their siblings, finally enjoying the stories being told instead of rolling my eyes as I had done when I was younger. As my tree began to grow, so did the pile of notes and papers I was collecting. I needed a better way to organize my research. At the time I had a Macintosh computer, and the only family tree software available for a Mac was Personal Ancestral File (PAF). This was a program developed by The Church of Jesus Christ of Latter-day Saints that was first released for the Macintosh in 1987. It wasn't a very intuitive program, and since there were not too many people using Macs at that time I did not have other people I could talk to about using the program. But I muddled through and was able to get my family information from numerous pieces of paper into a database. The most blessed part of genealogy programs is that you can export your information in what is called a GEDCOM format, which simply stated means that you can take it from one type of software and import it into another. Even if that means going from a Mac to a PC, which is what I eventually did. The limitations of PAF forced me into looking at other genealogy software programs in the late 1990s. By then I was predominantly using a PC and most genealogists I knew were using PC-based software programs. After looking at my options I went with Family Tree Maker as it seemed to have many features that I would utilize. 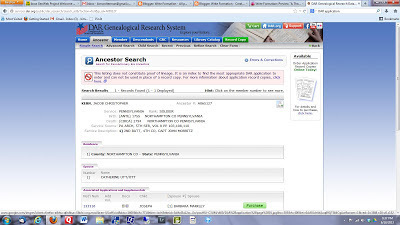 And the current version of the software neatly integrates with online tree I have been adding to through my subscription to Ancestry.com. Any changes I make on either my desktop tree or my online tree will synchronize at the push of a button. This was a huge selling point in getting me to upgrade my Family Tree software in 2012. Before if I made a change in one location I always had to remember to go and make the change in the other. I currently have over 2,400 people in my tree (which does include my husband's family as well, I should point out), so keeping track of all the names on paper alone would be a nightmare. Becoming interested in genealogy began through a tragic event in my family. But it has ended in a love and appreciation of family history, and an enjoyable hobby to boot. BlogHer is an online blogging community of women (and a few men). Each month they choose a topic with writing prompts to engage their community in writing a blog post each day. This month the theme is Roots. Since that is a topic near and dear to my heart, I decided to participate in my first ever NaBloPoMo, which stands for National Blog Posting Month. Thanks to my friend and fellow writer Linda Austin for making me aware of NaBloPoMo. Yesterday's prompt was asking how far you can go back in your family tree. Since I am a day late and a dollar short on that one, I will simply state that I have been doing genealogical research since 1989. I can trace part of my dad's family back to the late 1700s in Germany and England and the 1770s in Virginia. 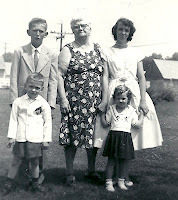 My mom's family I have back to 1796 in Ireland and the early 1700s in Germany. Today we have been asked to go back three generations and talk about where our family lived. This would mean discussing my grandparents. 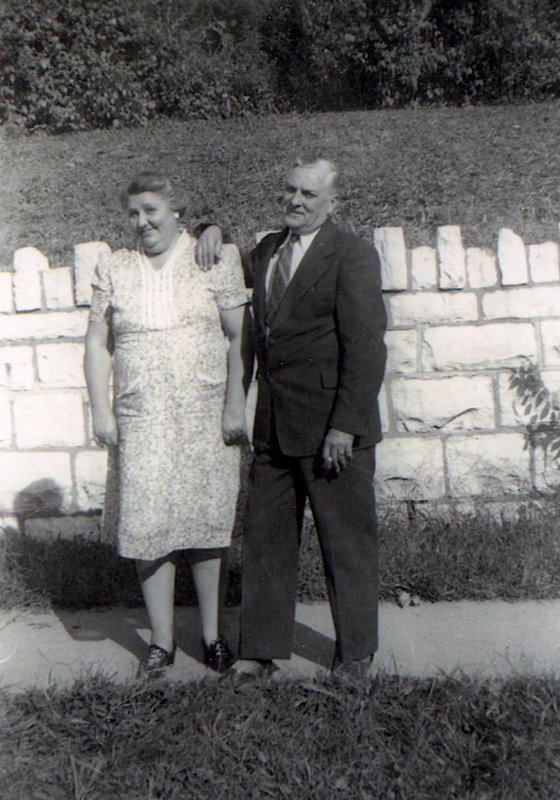 Both my maternal (Michael Crusham and Mary Metz Crusham) and fraternal (Joseph Kubler and Lillian Hungler Kubler) grandparents were born in Cincinnati, Ohio and lived in that city their entire lives. Cincinnati was founded in 1788 but was not incorporated as a city until 1819. Sitting on the banks of the Ohio River, some of the city's nicknames include Porkopolis (due to the herds of pigs in the streets when it was the country's chief hog packing center), Queen of the West (so-called by Henry Wadsworth Longfellow) and the City of Seven Hills (because it is surrounded by seven hills). My family tree consist mainly of folks from Germany and Ireland. German immigrants were drawn to Cincinnati in search of new opportunities, landing jobs as butchers, bakers, brewers or tailors. By the 1850s they had made themselves at home in their new country as evidenced by the appearance of German newspapers and the fact that German was now spoken at church services and in the church school classrooms. 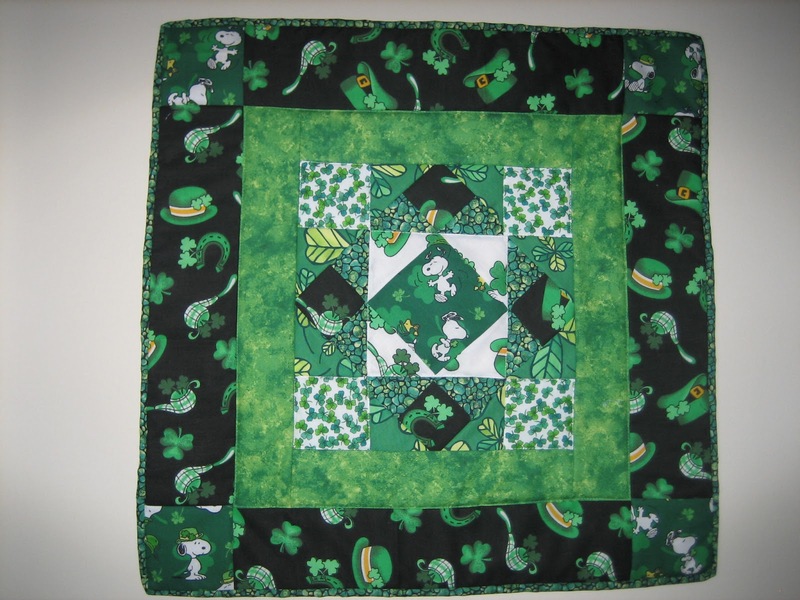 The Irish immigrants, on the other hand, came to Cincinnati because the city offered jobs working on the riverfront, digging the canals and constructing the railroads. Both sets of immigrants were heavily discriminated against by the citizens of Cincinnati. "No Irish need apply" signs were prominent in the city. My family survived, if not thrived, despite the discrimination, and except for our one branch of the tree nearly all the descendants still call the area home today.